I love a good cheeseburger but too often I find myself making the same old plain cheeseburger. I hosted a brunch a few weeks back and wanted to get creative with the menu and didn’t want to serve another pasta. 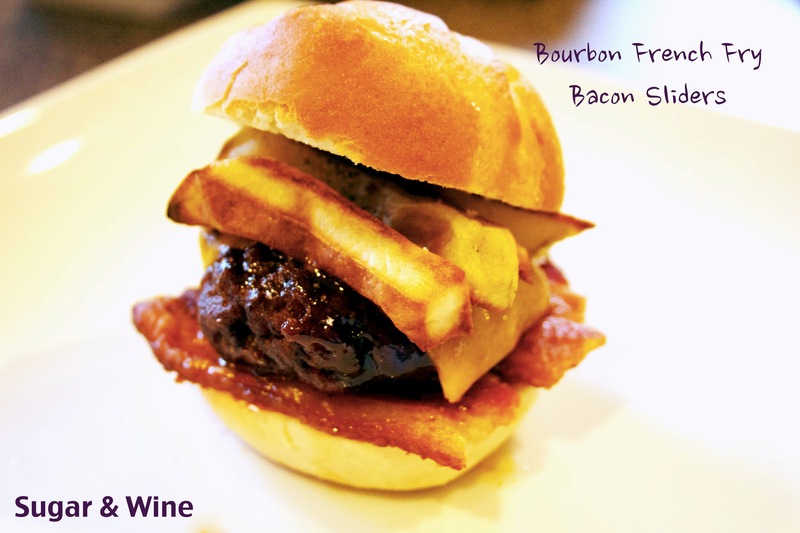 So, I landed on a sandwich that has beef, cheese, bacon and French fries—and alcohol. This burger drips with deliciousness in every bite. Undoubtedly, you are going to look and the instructions and think “woah.” This recipe looks complicated but these burgers will impress without actually a whole lot of work. I suggest pairing this sandwich with a salad or some other vegetable to balance out all the tastiness of this burger. But, hey, it’s a slider, not a full-size cheeseburger so it doesn’t count for real, right? Right? Start with the potatoes: Peel and cut them into small fries. In a bowl, mix the olive oil, salt and pepper. Toss the potatoes in the olive oil. Once coated, place on baking sheet and bake for about 15-20 minutes and then flip and bake for another 15-20 minutes. While the fries are baking, it is time to prep the sauce. In a sauce pan on low, mix together all of the ingredients except the cornstarch. Raise the temperature to medium-high and bring the sauce to a simmer, then whisk in the cornstarch. Let it cook for one more minute. Then set aside until ready. When the fries are done, its time to bake the bacon. Lower the temperature of the oven to 400 degrees and bake it for 15-20 minutes. Next, pre-heat your skillet (or indoor grill!). Divide the ground beef into 8 patties and place them on your skillet. Cook 5-7 minutes on each side depending on how well-done you want your hamburgers and your stove (gas vs. electric have given me different results). After the patties are done cooking, place them in the sauce and flip to coat them. If you want lighter results, you can drizzle the sauce on. Time to assemble: bun, bacon, burger, cheddar cheese, French fries, and then top of bun. Repeat x 7. And, there you have it: sliders so tasty that you’ll wish you doubled the recipe.